"When Joey put that trumpet to his lips, he blew against the walls of love and hate and every personal feeling I had for him ... And my heart came tumbling down!" "Lucky Jordan was a tophand cowpuncher. He knew steers and horses. He knew the tricks of sticking on a wild bronc's arching back, the loop of a lariat in midair, the thrill of diving towards the curving horns of a brahma bull inside the rodeo arena. But there were some things Lucky didn't know. On the subject of women, he wasn't so wise. So this is Lucky's story and it opens on the graze ground of his little mill iron ranch, over a branding iron fire ... "
Yessir, romance is in the air today at BOTB's Comic Supplement! We're back with a passel of cool stories and art, including work by two giants in the comic book field: Harvey Kurtzman and Jack Kirby! Let's learn a few love tricks from the true-life entanglements and foibles presented in our tales today - join us right after the jump! 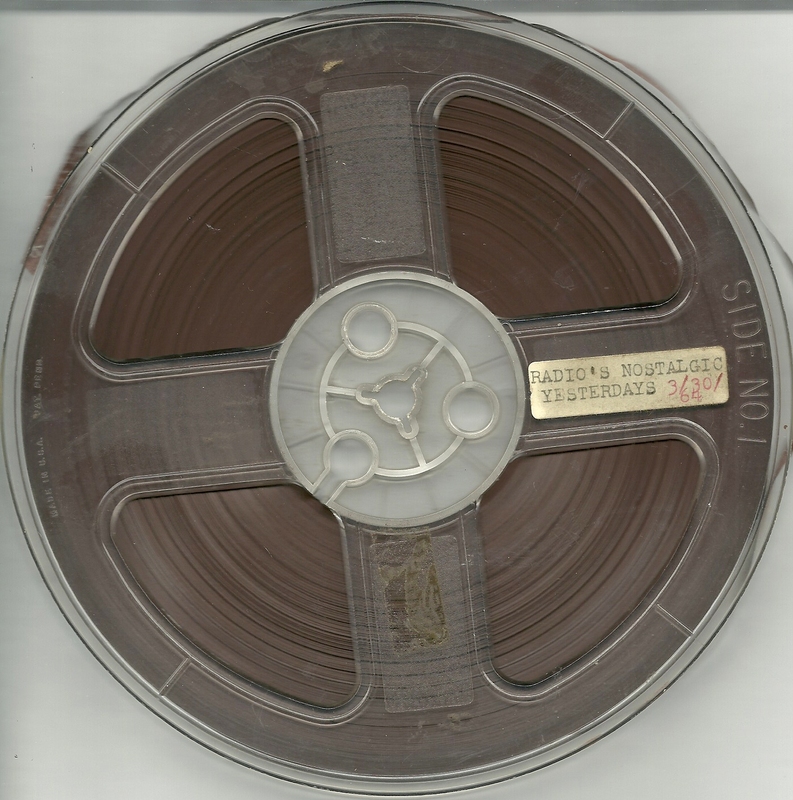 Here's a nice little five inch reel of tape, containing some of the work by the William D. Cunningham & Associates, Inc., Company, whose promo reel for voice talent I featured four years ago. The dates for these various ads, based on some of the products featured (and the presence of a Bicentennial ad) would appear to be in the 1974-1977 range. 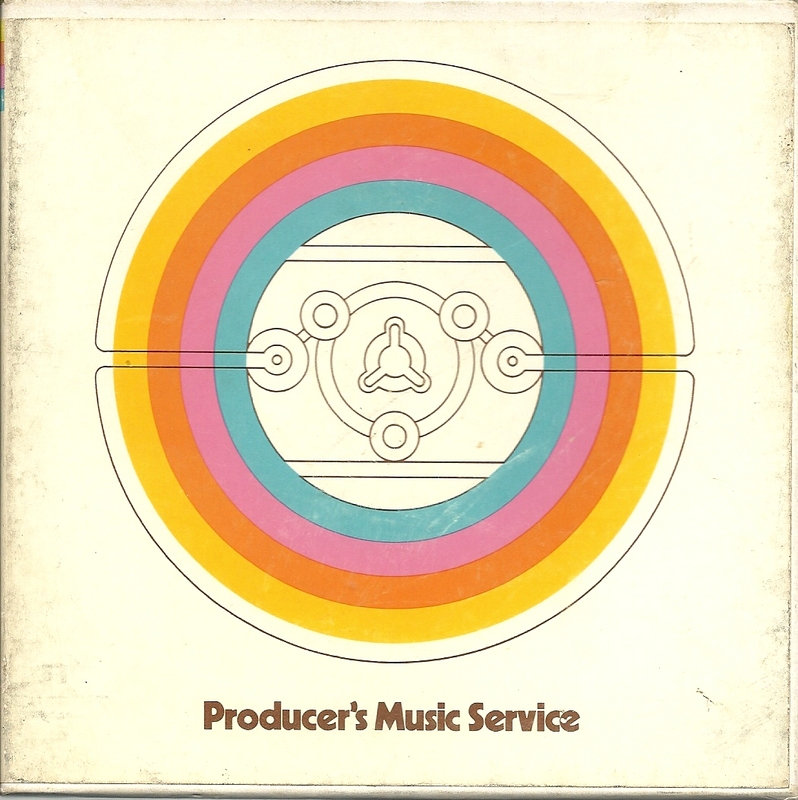 In many places, this reel has the ads literally back to back, with one starting as the previous one ends, so I haven't attempted to separate them out - you can hear them below as they were intended to be presented - a blast of 18 examples of the "Producer's Music Service" (as it's called on the box), in just under 15 minutes. Some ads are just music beds, others have introductory and closing vocals with music beds in between, and others are full singing ads. Some are brief, others don't conform to the typical 60-minutes-at-most rule (the Jet Ski ad runs over 90 seconds). 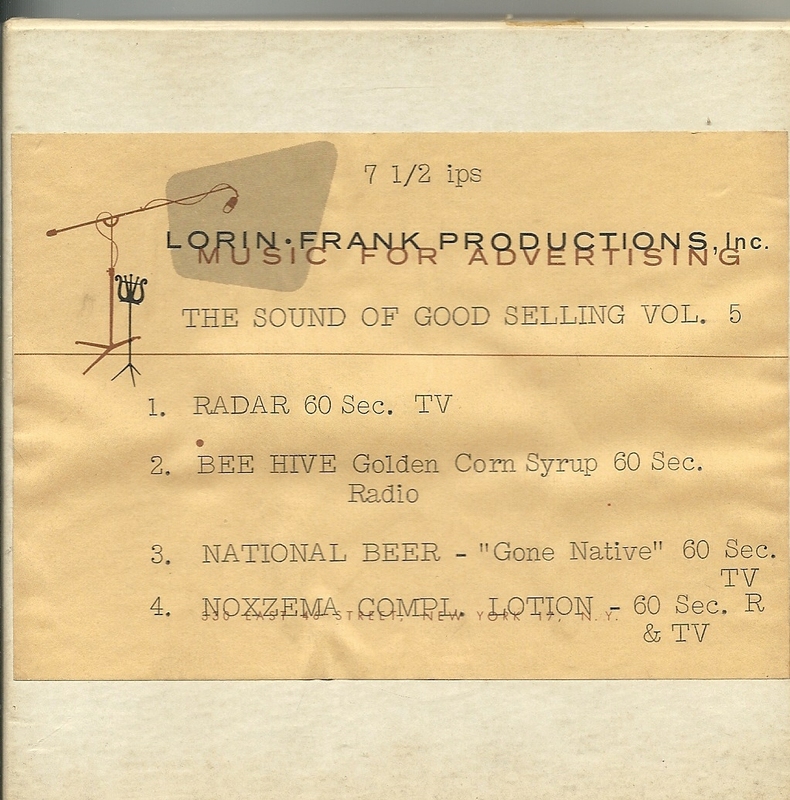 The individual tracks are listed in the scan to the right. I wish I could get some of that Carbonated Kool-Aid. "Flung into a series of amazing adventures by his impetuous nature, and intense hatred of injustice, John Wallace finds himself the possessor of the wonderful Pipes of Death and becomes the Music Master, matching long forgotten secrets of the ancients against the marvels of modern science..."
So begins the nearly three year run of a character high on the list of "Most Oddball and Bizarre" comic book characters from the Golden Age, our pal the Music Master, who needs only a note of music, or at least a burst of sound approximating a musical note, to perform strange and fantastic feats. Even though studying weirdo comic book character ideas is a long-time obsession of mine, I had only recently learned about this fella while trolling through old issues of Famous Funnies, one of the early magazines published in the comic magazine format. In the later issues of FF they began to introduce original in-house characters (in addition to their standard fare of newspaper strip reprints), and also promote new ones from their sister magazine Reg'lar Fellers Heroic Comics. In one of these colorful in-house ads I noticed a new character being promoted named 'Music Master', who sounded like a shoe-in for a WFMU blog post, or at least worth a closer look. 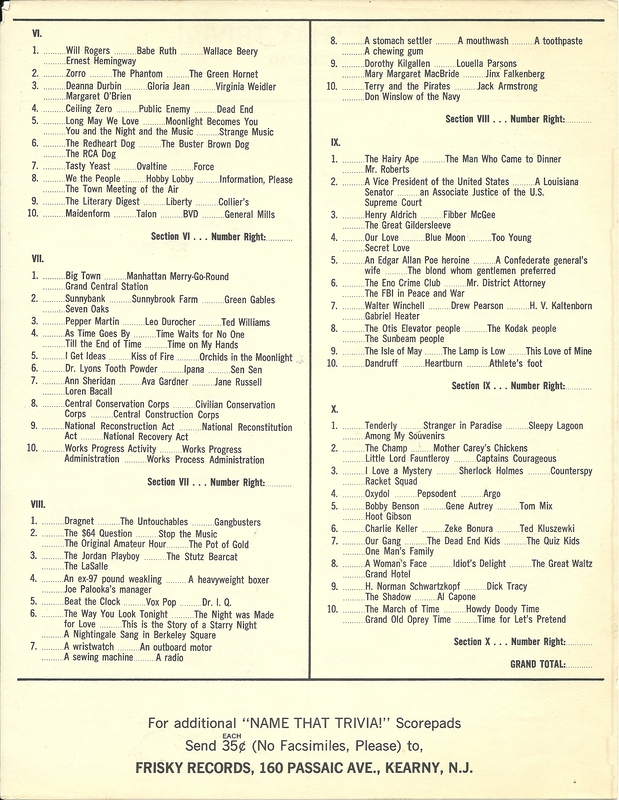 Luckily, these magazines are in public domain, so I downloaded the entire run of Music Man stories to study. In his first yarn our protagonist is quickly stabbed in the chest and mortally wounded with a violin bow. Well, now, this had me going right off! I certainly haven't seen any comic book crooks deal out violence that way before. Thanks to the musical ministrations of Antonini the famed violin maker he is not only revived (using an 'ancient Egyptian instrument') but his body has become "...attuned to the frequency of musical sound waves, and that he can identify himself with any musical note so that his body will react and cling to the waves of sound, and he will be transported with the speed of sound to the source of the music.". As time passes the writer of the series, Stephen A. Douglas, also the editor of the magazine, develops many more unusual things to do with hero 'John Wallace's' audio-based powers, often venturing into surreal territory. While not one of the most amazingly weird hero characters from the early 1940s (and there are a lot of VERY strange concepts that were tried), he has his moments, along with some lovely art here and there by various hands. Come along and join our long-haired composer/player/super-hero as he battles crime right after the jump! 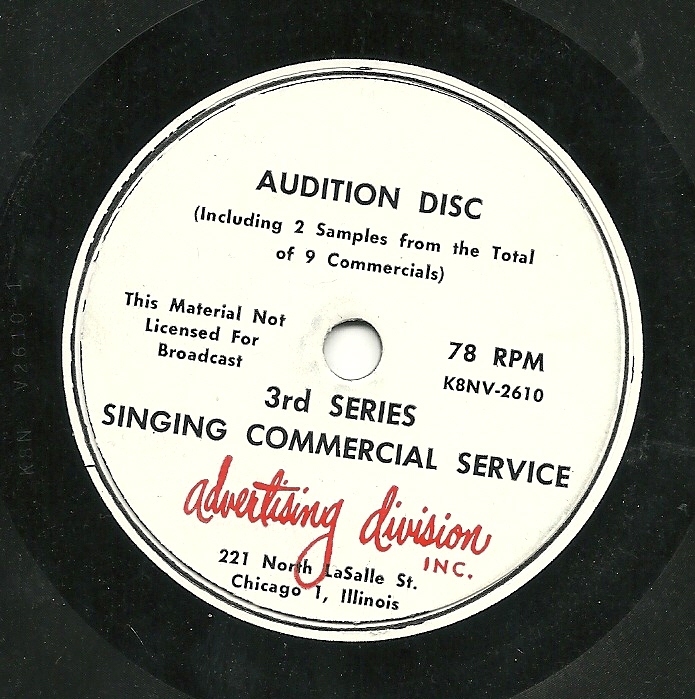 Hot on the heels of the three-part series of Bob Hahn radio jingles from earlier this year, here's another reel full of fun ads. Produced by one of the most famous advertising agencies in the world, Batton, Barton, Durstine and Osborn - better known as BBDO, it's a series of ten ads (well, maybe just eight) for Lucky Lager, dating to March of 1964. To my ears, the first two ads ("Hootenanny - Regular") are identical, and the box suggests this, as well. The last two ads ("Hootenanny - Northwest") also seem to be identical. In addition, these two sets of ads only differ from each other in that a couple of lines are changed near the end of the respective ads. This is why, although I have ten tracks posted, I'm pretty sure there are only eight ads here. But in case I'm wrong, I've included all of them. And all of the ads are based on the same music, and, with one exception (the "Lift Top" ad), on the same basic lyric. There is ad heard in Spanish, but it still seems to contain essentially the same text, albeit in another language. There are also two ads featuring famed bluesman Jimmy Witherspoon. One features his own take on the material, at the standard 60 seconds. 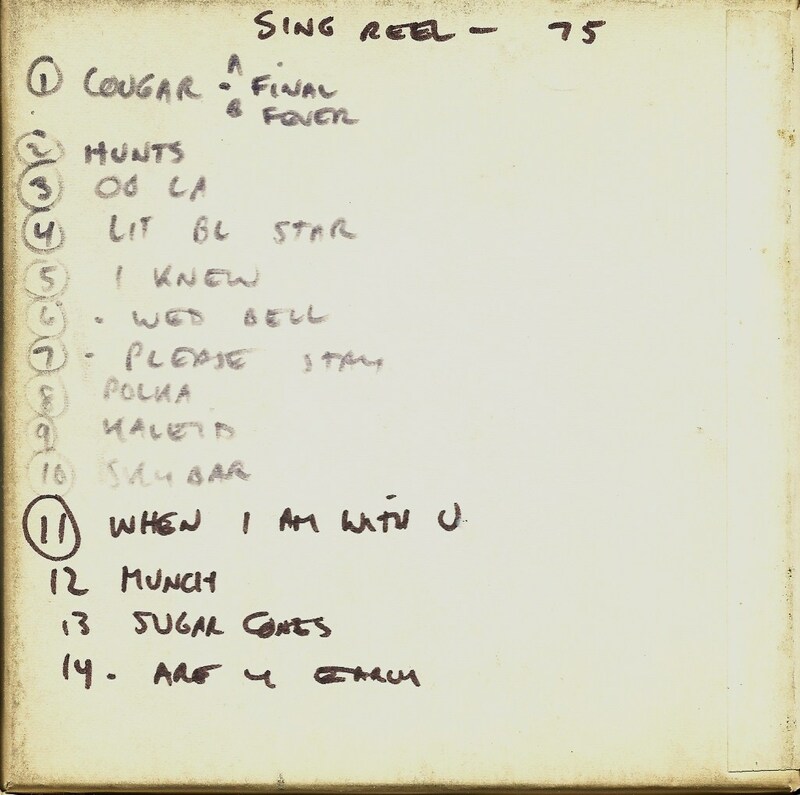 The other, though (track 8), while the other is, surprisingly, two minutes and 45 seconds long (the tape box claims it's four minutes long!). It's not clear to me where this would have been aired or under what circumstances. Also of interest is the "Roaring Twenties" ad, which does a particularly bad job, in my hearing, of capturing the sound and feel of that era, and "Lift Top", which appears to describe a very early attempt to get around the problem of sharp pull tabs. 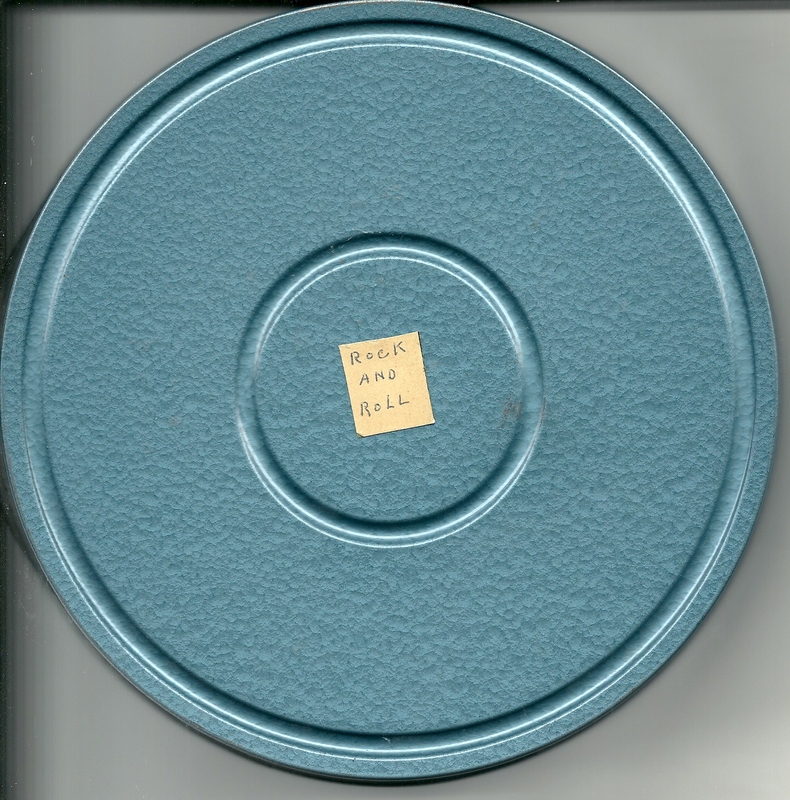 Over the past two months, I have shared the contents of two tapes, from a group of four reel to reel tapes I recently purchased, sampler reels of the work of Canadian ad-man Bob Hahn. Volume Three of the tapes contains just two ads, in multiple minor variations, and one of those two ads is represented on Tape Four, so aside from two versions of one track, I've skipped over the third reel. Today, the fourth and final reel. 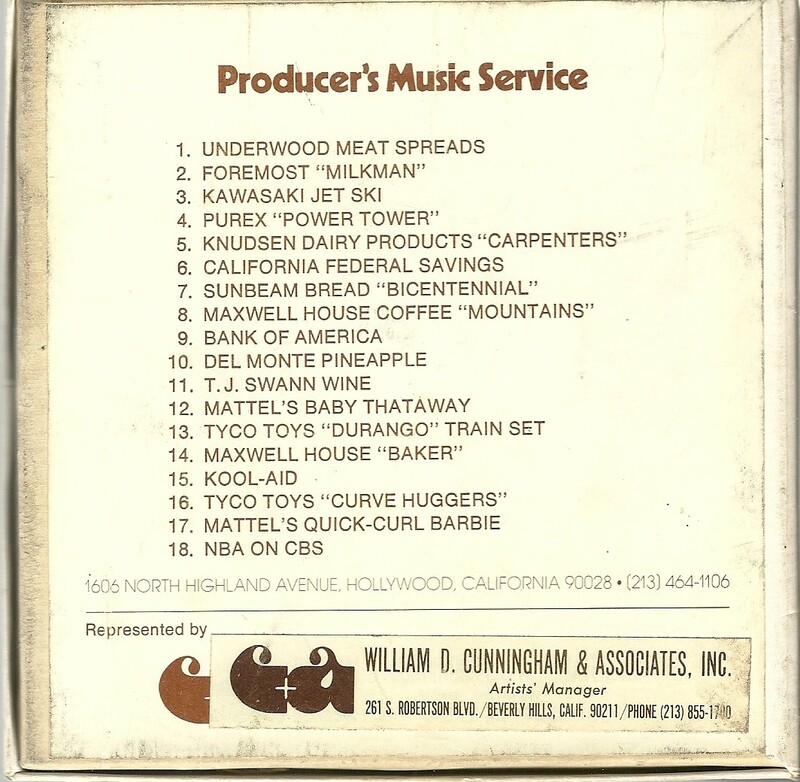 There are seven ads and five other fragments on this tape, and all but the last of those twelve tracks are for the products of the Dow Brewery. The Dow Brewery did not survive with its good name intact for much longer after these 1961 ads, as you can read about here. 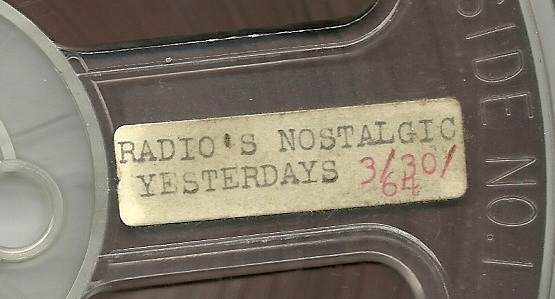 The tracks on this tape are divided into similar ads for different markets. 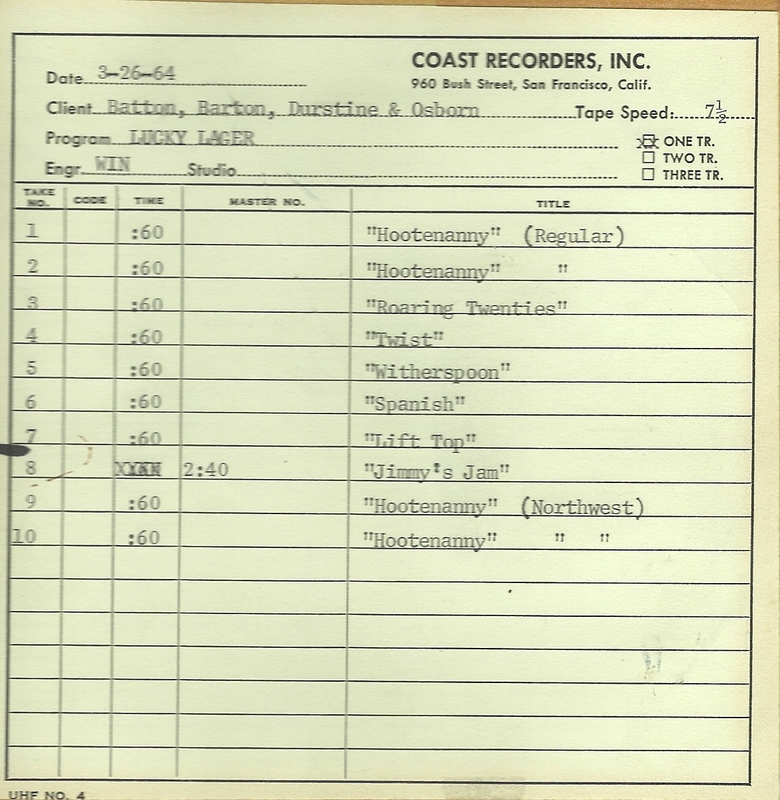 First there is a square dance track, one for Canadian stations and one for American stations. Aside from minor cosmetic differences, these two mainly differ in that in Canada, "Dow Brings Out the Best in Cheer", while in America, "Dow Brings Out the Best in Beer". There's a sociological research paper waiting to be written within the decision to alter those words for the differing market.There is also an isolation track of the advertising tag line. This is followed by two ads featuring harmonica orchestras. Both are heard with vocals in English, then in French versions (which amount to the instrumental harmonica tracks, with voiceover in French at the end. The moment at about 18 seconds into the second ad (in both languages' ads) is one of the weirder things I've heard in an ad from this era. In the English ad, it's startling; in the French ad, it makes no sense whatsoever. 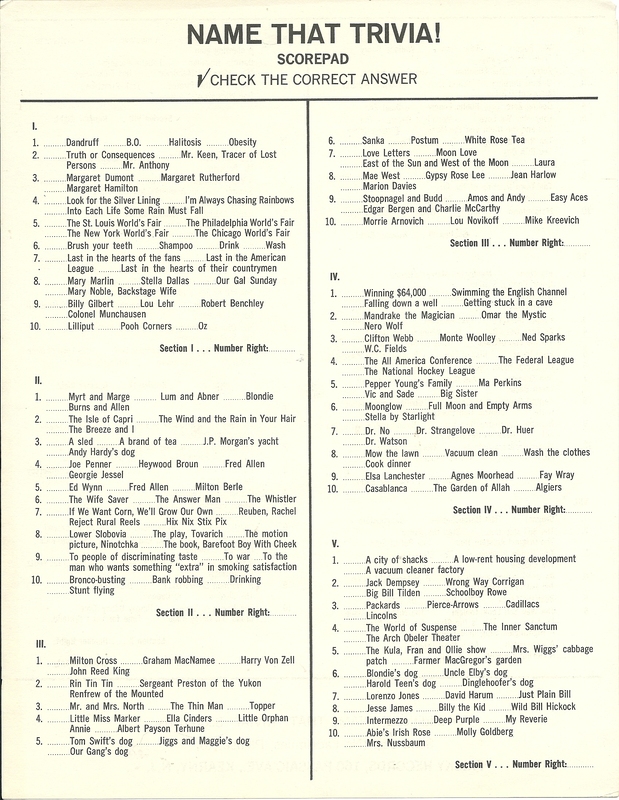 These are followed by more excerpted sections of the square dance ads - I'm not clear on the use of the two short end pieces which I've grouped together as the 9th item here (the "wild tag" listed as the 11th track is identical to the 8th track, and is not included). Finally comes the only non-Dow ad of the reel, which is for Parliament Cigarettes. At the end, I've included the only ads which were unique to reel three. These are American and Canadian versions of an ad for Kingsbeer. The differences here are all in the second verse - the American version focuses on the brewing and the taste of the beer, while the Canadian version repeats the first verse heard in both versions. 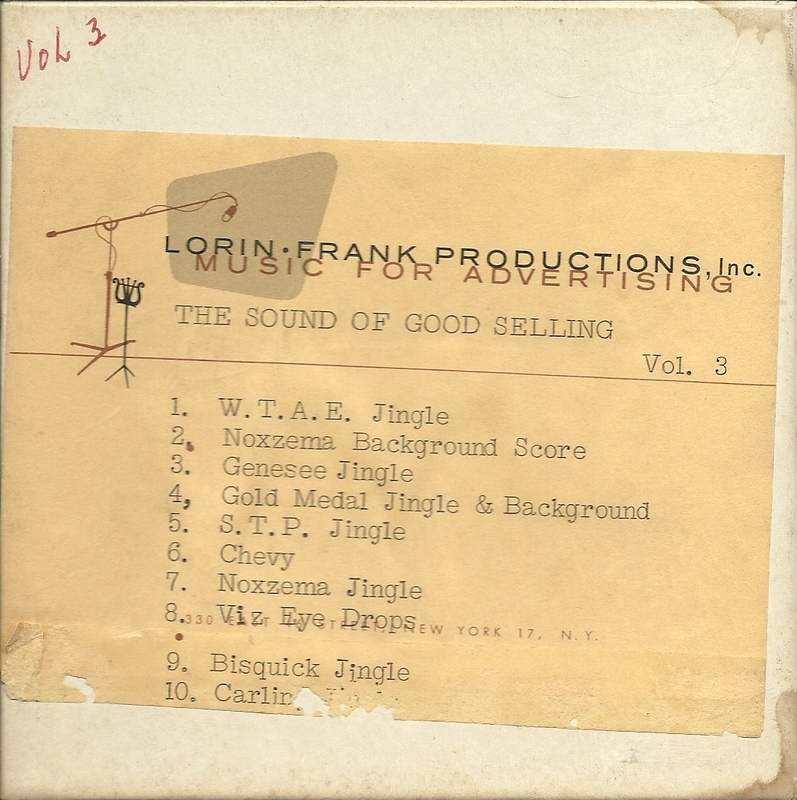 Last month, I offered up the contents of the first in a group of reel to reel tapes I recently purchased, sampler reels of the work of Canadian ad-man Bob Hahn. Today, volume two of those tapes. All but two of the 12 ads on this tape are for or cigarettes (two ads) or beer (eight ads). The most interesting aspects here, to me, are in the five Molson ads, with their varying focuses on what people in different fields would consider to be two things which go together perfectly - I wonder at what point advertising would cease making reference to Minstrel shows. Also of interest is that these ads are each 70 seconds long, a length which I've not generally seen in the hundreds of ads I own. I also get a kick out of the slogan at the focus of the two ads for Dominion stores: "It's Mainly Because of the Meat!" I'm sure those of you who play with sound can use those cliips. I know I will. 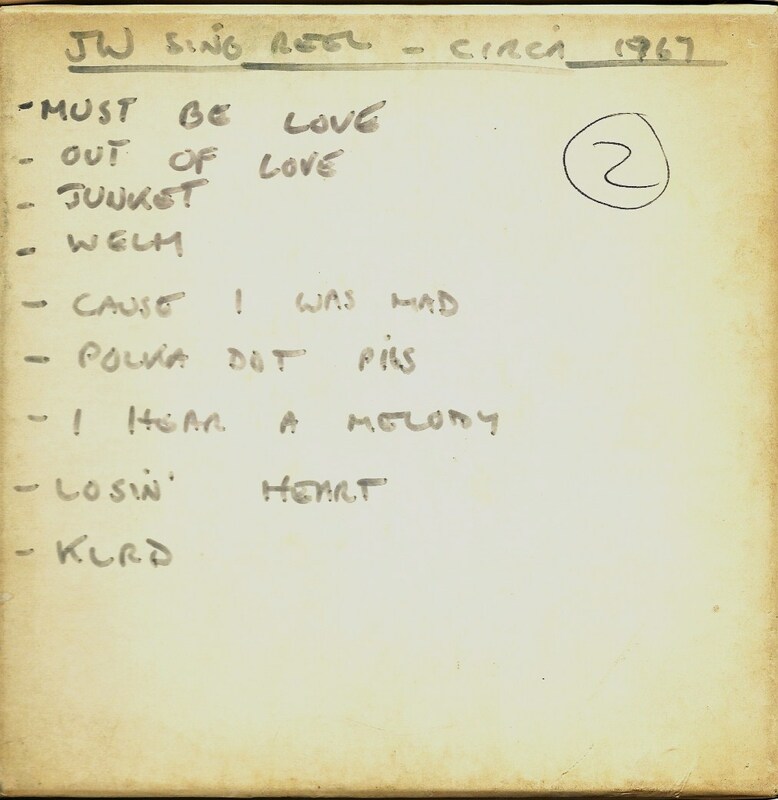 Here's a keen little seven inch 78, which I'm guessing, based on the musical styles, is from the mid to late 1950's. It came to use from "Adverising Division, Inc.", in Chicago, and is the third in a series. As the salesman says in opening this little two minute wonder, "You can't sell 'em, until you tell 'em! ", and what he wants to help you sell is your savings and loan operation. There follow two examples from a total of nine available commercials in the package. It's not clear to me how buying these ads would make them "yours exclusively" - what if two savings and loans bought the package in the same market? Regardless of all that, the ads are two wonderful examples of the bouncy, peppy and positive-sounding ads of the day, and the second one also has the benefit of all that great reverb which was such a hallmark of the era. As I always seem to say when I share commercials from that era, I wish radio still sounded like this.